Sure to be nominated for Best Documentary at this year’s Academy Awards is Jane, the story of Jane Goodall. That’s a simply description, it’s a simple film, and yet it is also unequivocally beautiful in its focus and its attention to sifting through all the many years to extract what is essential, important, and what we need to hear before Goodall becomes just another highlighted word in a textbook. This film was formed by found footage, reenacting her early life, in a way, while speaking with her now to get both sides of the timeline. Jane narrates her own life for us as we watch it unfold on camera, and a documentary has never been more captivating or more magical. Jane Goodall was picked for a research project in Africa because she wasn’t a scientist, wasn’t a biologist, hadn’t even been to university. She simply loved animals, wanted to observe them, promised to be objective, exhibited uncanny patience, and devoted her entire life to living among them so as to know them better. 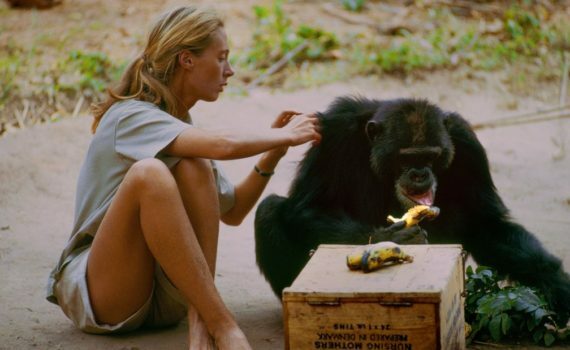 Her dream was to live in Africa among primates, and so that is what she did, spending years among a community of chimpanzees, studying their behavior and relating their world to our own. She would go on to get married, have a son, move to different parts of the globe, but the chimps would always be her first love, and it’s this passion that made her into the historic figure we know her as today. What a lovely film, and what an incredibly captivating documentary. I found myself lost in the footage, in the quiet moments, in the hours Jane simply sat and watched, gaining the animals’ trust as she gradually became part of the landscape. She had a life, she had desires, but her one goal was to show the world that we aren’t the only intelligent creatures on Earth, that this isn’t just our home, and wow did she succeed. It’s a rare opportunity to see her early career from this perspective, and you’ll never spend a more pleasant 90 minutes in front of a screen. I don’t have a desire to watch documentaries very often, but I’m so glad I watched this one, and I highly recommend that you do the same.